Similar to time trials but shorter and apparently more painful. 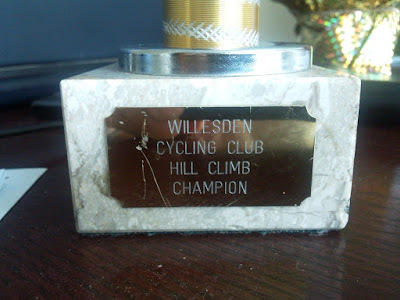 I missed out on the summer season's 10m club time trials but thought I'd make up by doing some of the local hill climbs. Anyone else do these? on fixed? There's always Swain's Lane in Highgate.. Richmond park clockwise? Somewhere more central would probably be eastbound, pentonville rd. A bit far for him. The man lives in the a place where Human League, ABC and Cabaret Voltaire are from. @ seldom killer: Which hills have you got up there? Which hills haven't we got up here. I did Cat & Fiddle hillclimb on 42/16 last year - too high for the bottom of the course and too spinny for the top. and a bonus shot of the legend himself..
All the eloquent poise and build of a classic climber. Are you not defending your title then? We've got the full range of hills in these parts (Yorkshire). Winnats Pass, recently featuring in the Tweed Excursion, Sutton Bank, the Snake Pass. Sheffield, where I live, proclaims to be like Rome, being built on seven hills, all of them hard and steep in parts, especially Gleadless, which recently formed part of my commute. The one that I'm looking at as an organised hill climb is Monsal Head, where I got taken on Saturday with the Norton Wheelers. We went down it but on first impressions I reckon it might be good for attacking it on 42x18. I'll have to check the route as I'm not sure how much lead in they offer. I've taken a sudden interest in all things that don't involve cycling. I've been ignoring the club site and the other forums for a while whilst upping my intake of performancing diminishing substances. But to answer you question, I just looked and it's mid-Oct. I might have regained some interest before then and give it a shot. Has anyone done the hill climb on Leith Hill? Can you recommend a gear? Well I've got the chainring and sprocket available for a 63", so I'll spin a little more on that. ^could work better for your anyway, as you're perhaps more of a sit down climber than me, and might not have quite as much standing oomph on the last bit. Good luck. Just throwing this on here to see if anyone is interested in a hill climb up Exedown, famous for being on the Kent I TNRC. £100 first prize! Hey Sam, you doing it? I probably will enter, just need to wait until Friday for Chq book. I have entered the Catford and the Wigmore as well, anyone else entered? You're joking, maybe if they had a wooden spoon prize! Not affiliated to a club, this does mean no entry doesn't it? I'll go and watch if the weather's Ok, same goes for Yorks the week before.